…or at least it seems that way based on a flurry of articles lately. We've posted about inbox zero and ways to get started before. Today, the guys at 37 Signals made a post on their excellent blog about Highrise and inbox zero and referenced a new inbox zero article in the New York Times. It's great to see so much focus on inbox zero and email efficiency in general. It's not a big surprise, as people are definitely having to get more done with less resources these days. And getting better at email is one key way they can make that happen. The 37 Signals post showed how Highrise users can snooze emails to make them go away for a while, which is very useful when aiming for inbox zero. ClearContext Pro users are able to do this by deferring emails and having them return to the inbox whenever they choose. That's just one of the many features in ClearContext Pro to help quickly process emails. The New York Times article has a ton of straightforward and useful tips, as well as pointers to some good resources about handling email and achieving inbox zero. We're especially excited about all of this because of the Email Effectiveness capabilities we're introducing in ClearContext (in both Pro and our free Personal product). Our current release has a sneak preview of these capabilities, including the ability to track your progress towards inbox zero within Outlook. And there's much more coming soon. You can download here and check it out! Hopefully you're now well on your way to earning your Inbox Zero Nerd Merit Badge! Posted by deva at 5:28 pm on March 5th, 2009. 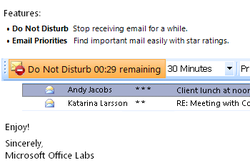 One is a "Do Not Disturb" feature that pauses new email from being sent from the Exchange server to your Outlook client. The other is an email prioritizer that puts 0 to 3 stars next to each email to help identify important email. Webware reviews the product and Todd Bishop writes about the project’s background based on a Microsoft Research project from 2005 led by Eric Horvitz. paid version – which also helps people manage workflow and projects within Outlook. Over the past few years we’ve learned a lot about how email prioritization and triage can help people deal with overloaded inboxes. It’s an important part of the solution, but only one of many required parts to help people deal with information more effectively. Really helping people solve the problem requires a lot more than just identifying important messages. "unsubscribing" from them. Enter your info on the beta page and we’ll send you download information so you can try it out. It’s great to see Microsoft and others acknowledging what a critical issue information overload is for people, and we’re confident you’ll find ClearContext Personal a very useful tool to help highlight your most important contacts and messages – and much more.